What Can You Do With This Wearable Tech? If you’re not a personal trainer or fitness pro, it’s difficult to assess whether or not your workouts are truly targeting the areas you want. Leave it to the latest in wearable tech to give you the scoop on exactly what muscle groups you’re working when you exercise, and so much more. It’s called Athos, a two-part fitness tracking system that measures and records a wealth of real-time data to help you maximize your workouts on your own. Athos is one serious gear upgrade. It uses a technology commonly used in physiotherapy to measure and evaluate electrical signals made by your muscles as you move. This is tracked by red, oval sensors that are embedded into sleek apparel over various muscle groups. Each sensor—also called “the core”—measures effort from up to 14 muscles, as well as your heart rate and breathing rate. Each super-light sensor is furnished with two multi-color LED lights that show your workout in progress, has a 10 hour battery life, and is waterproof (read: sweatproof—don’t take these guys for a lap in the pool). The Bluetooth-equipped device sends all of its data to an iOs compatible app, where it compartmentalizes literally everything about the workout you just did—from keeping track of reps and sets, to tracking a consistent rhythm and focusing on form. These workout summaries not only show you exactly how you performed, but can help you keep your workouts as relevant as possible. When you gear up in Athos, you’ll never utter the words “personal trainer” ever again. 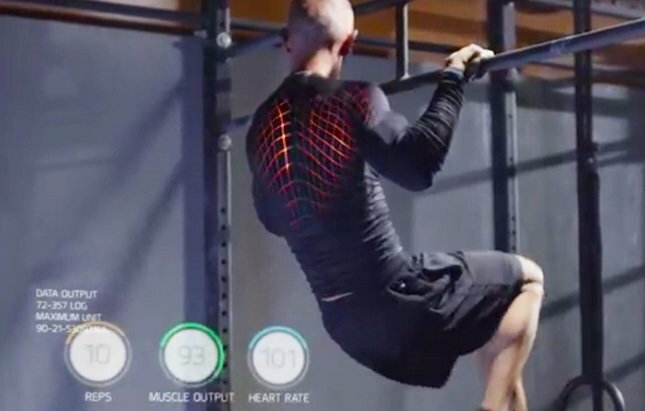 Traditionally, the sensors like the ones we’ve been talking about are affixed to the body with adhesive patches to measure your muscles’ electrical activity. But Athos makes this technology truly wearable by embedding them into compatible men’s and women’s apparel. The garments—which include long sleeve tops, cycling shorts for gents, and cropped pants for ladies—look like your typical modern workout attire: streamlined, stretchy, and insanely durable. The only noticeable difference is that each garment includes one pocket for you to place the “core.” Placement is precise—not only for efficient muscle readings, but also to maximize comfort, which keeps your workouts fuss free. Though the Athos wearable tech system is currently being tested on pro athletes, its available to pre-order by anyone. The core will run you $199—you’ll need two if you want to track your upper and lower body at the same time—while each garment is priced at $99: that adds up to a $596 bill for the whole package. But with all of this data at your fingertips, it just might be worth trading in that personal trainer. Would you gear up for your workouts with this wearable tech? How do you keep track of your exercise routine? Do you use any other high tech systems we should know about? Tell us in the comments below!